Substitute any merit badge for “Astronomy” and you have a common but tricky question. The answer lies in the exact written requirements. Scout Jay must meet the requirements exactly as written, no more and no less. If a disability prevents him from completing the requirements, then Jay must earn a different merit badge. 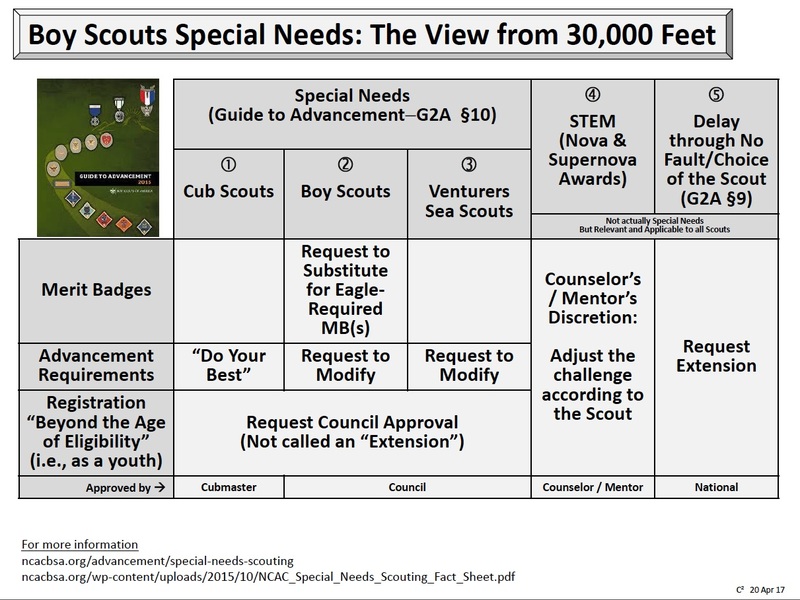 Modern merit badge requirements are often flexible to benefit Scouts with disabilities. For example, most merit badges don’t explicitly require reading, writing, or speaking. Instead of saying “Write a list of the five most visible planets,” or “Recite a list of the five most visible planets,” the Astronomy requirement simply says “List the five most visible planets.” The form and structure of the list is not part of the requirement. The Advancement program is meant to be challenging for every Scout. Those challenges can become even larger for Scouts with special needs. Since the Guide to Advancement clearly states that all requirements have to be met, communication between the Scout, his parents, unit leaders, and even educators can lead to real success stories.